“Fun” is not a word often associated with static isometric exercises like planking. But research shows this old standby is excellent for strengthening your core, engaging more than 20 muscles while improving your balance. So why not switch things up to make planking more interesting and enjoyable? You need nothing but a strong core (or the desire for one!) to do the following exercises. Practice them at home, at the gym or even at work – just make sure you keep good form. Enlist the help of a mirror, friend or personal trainer, if necessary. Tip: If flat palms bother your wrists, clasp your hands together. 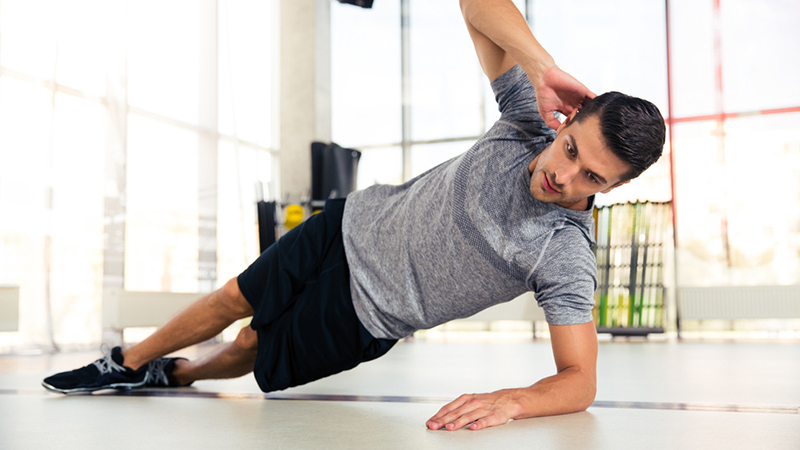 Start in the standard plank position, your body in a straight line and weight on your forearms. Holding your core and shoulders tight, rock your whole body forward until your head is just beyond your hands. Rock back until your heels are past your toes and your elbows are in front of you. Continue the motion. Start in a standard elbow plank with your legs together. Now jump both your feet out simultaneously, as if you were doing a standing jumping jack. Jump both feet back together. Feel free to use the movement’s momentum, as long as you keep your booty down. Start in a standard elbow plank. Keeping your elbows in, push up to your hands, keeping your body straight throughout. Lower back down to your forearms using both arms at the same time. Start in a standard plank. Bending your right leg to about 90 degrees, lift your right foot in the air. Reach your right leg over your lower back, touching your right toe to the ground on your left side. Return your leg to its original position and repeat on the other side. Tip: Don’t lock or hyper extend your knees; keep your legs straight but neutral. To help keep your neck, head and spine aligned, keep your eyes on a spot on the floor about a foot beyond your hands. And resist the urge to let your booty rise to the sky. Start in a high plank position (like the top of a pushup). Moving both your hand and leg at the same time, take a step to the side. Use the other arm and leg to return to your starting location, unless you want to crab-plank your way down a hallway or sidewalk. In that case, be sure to switch sides halfway to your destination to work both sides of your body equally. Take a step to the side by moving both your hand and your leg. Start on your hands and knees facing away from a wall. Your hands should be just in front of your shoulders this time, arms straight. Raise one foot onto the wall, then the other. Your body should be parallel to the floor. Channel your inner table. Hold. Start in a high plank position. Flexing your right foot and rotating it out with your hip, bring your right knee to your right elbow. Look over your right shoulder as you complete the movement. Is your leg bent 90 degrees? Good. You’re doing it right. Now lower the right leg and do the same on the left. Tip: This yoga pose and its variations work your obliques extra hard. Lay your top foot down just in front of your bottom foot for a slightly easier variation. To get to a standard side plank, start in an elbow plank position. Now bring your legs together, touching your heels together. Lean your whole body to the right while lifting your right arm straight toward the ceiling. Your shoulders and hips should be vertically aligned, with your weight balanced on the left foot and left forearm. Hold. Start in a standard side plank with your right arm reaching toward the sky. Bend your right arm so your elbow points up. Bend your right leg as you bring your right knee toward your elbow. Let them meet as you feel the burn. Complete at least 10 reps on this side before turning over and using the left arm and leg on top. Begin again in the standard side plank, right arm lifted to the sky. Bending slightly at the waist, reach your right hand down and “thread” your right arm through the space between your armpit and the floor. Return to starting position. Complete at least 10 reps on this side before turning over and using the left arm and leg on top. If you’re new to the plank, start with 30 seconds at a time. Can’t get enough? Check out more plank variations or increase your time. Add 15 seconds every week and you never know – you could beat the 4 hours 26 minute world record!